Team Sarah’s Top 4 had been completed on February 1, 2015 after the result of the viewers’ vote had been tallied in. The Top 4 of each team will go on to the next round of The Voice of the Philippines Season 2. Did your favorite artist survive? Apl prepared a mashup of his original songs with the contenders for the live viewers of the Resorts World Manila. The artist of Team Sarah gave their best shot to impress their coach and the viewers. Jason Dy said that he had idolized Ed Sheeran and he decided to sing ‘Thinking Out Loud’. Sarah said that he makes her fall in love every single time she hears him and shared that he he had the ability to touch people’s hearts. Douglas sung ‘Home’ to express his hopes to just stay in the country to be with his family instead of working abroad. Sarah said that she was able to connect with the song. Reggae artist Kokoi Baldo had been challenged by Sarah to sing ‘Love and Devotion’ as if it was his first time to sing it. Kokoi was moved to tears as Sarah shared how deeply she was touch by his devotion to his craft. With 46.81 percent of the total votes, Kokoi will continue his journey in the competition. Sarah thanked Douglas and Jason for the talent and dedication that they had poured in the competition. Sarah had decided to keep Jason Dy in the competition. Sarah stood from her seat as she clapped her hands to bid farewell to Douglas. 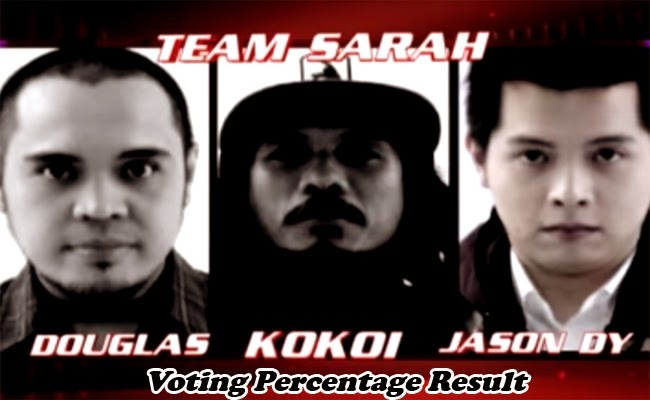 Jason Fernandez and Monique Lualhati had been joined by Kokoi baldo and Jason Dy , completing the Top 4 of Team Sarah to go on to the next rounds of the competition.